Everything auspicious in our life is because of the blessings of different forms of Mother Almighty. As per different aspects of life, the Mother takes different forms and provides the deserving, what they need in order to get blissfully through life. When it comes to surviving in the highly materialistic world, every human being needs a certain amount of wealth to meet the required expenses and take care of oneself and his/her family. While there is no set ceiling to what can be considered as enough, but it is fair and natural to have a genuine expectation of having optimum wealth in this life to support ourselves along with our family. However, only a few live a life where they do not have to worry about finances or face financial crunches from time to time in their lives. Many people go through financially turbulent times not because they don't try working hard but simply because their negative karmic structure from past lives is so strong that it poses hurdles in numerous aspects of their current life. This negative karmic structure unfolds in many different ways. In the form of bad health, delay or problems in marriage etc. But the most troubling one is: 'Problems in Finances'. Goddess Laxmi is the divine form of Mother Almighty that blesses Her devotees with wealth and prosperity. With the blessings of Goddess Laxmi, one enjoys wealth in abundance and a financially secure life. If a person manages to please Goddess Laxmi, then wealth and prosperity will be a natural consequence in his/her life. So, how can one please the divine Goddess Laxmi to have a prosperous and successful life? Simple, by a Laxmi Puja! Laxmi Puja is a holy ritual that pleases Goddess Laxmi, resulting in Her powerful blessings upon the native. Hence, we urge you to book a Laxmi Puja for yourself, to receive the blessings of Goddess Laxmi and enjoy abundance of wealth and a permanent presence of prosperity in your life! It brings prosperity in life. It removes all financial and monetary problems from an individual's life. It attracts energies that promote abundance of funds and wealth in life. 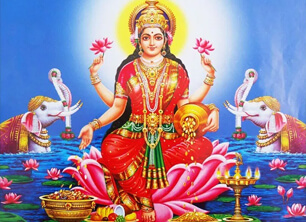 Laxmi Puja opens the doorway of growth opportunities in one's professional domain and enhances the chance of a promotion in job or a positive job change. Laxmi Puja promotes a significant increase in business orders and protects a business from regulatory hurdles and unwanted competition in the market. Laxmi Puja helps the native in attaining a sound health by curing many ailments present in the life of the native due to some troubled karmic structure. Laxmi Puja brings lucrative avenues of investment in one's life. Laxmi Puja results in gainful ventures in the area of real estate or property. It promotes beneficial business travels. Laxmi Puja on your behalf by highly learned Brahmin Priests to bring forth the divine blessings of Goddess Laxmi in your life. Note: The Laxmi Puja is performed in strict accordance with all Vedic rules & rituals as prescribed in the Holy Scriptures. Why should I go for Laxmi Puja? Goddess Laxmi is the Goddess of wealth & prosperity, therefore, Her blessings would pave the way of success & abundance in your life. So, go for this life altering ritual! Who will perform the Laxmi Puja? Absolutely, you can watch the Laxmi Puja being performed in your name via a recording provided to you by us. Is there any minimum age to go for Laxmi Puja? No. Anyone can go for this Laxmi Puja. Can I book the Laxmi Puja for someone else in my family? Absolutely! What better gift can you give to your near and dear ones, than making sure that they get the blessings of Goddess Laxmi!